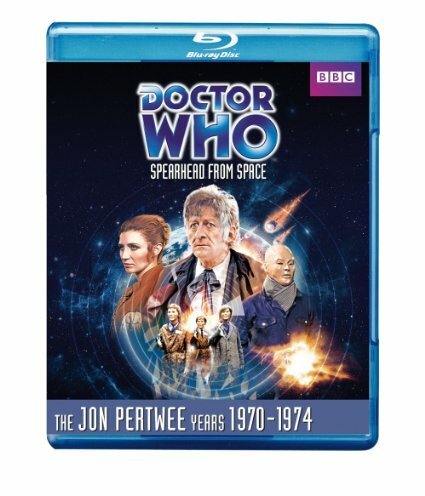 Digitally remastered Doctor Who classic Spearhead from Space, now in Blu-ray! Exile! The Time Lords have banished the newly regenerated Doctor to Earth. But the Doctor isn't the only alien to have arrived, as a swarm of meteorites have crashed into the sleepy English countryside, bringing with them a terrible new threat to mankind. As the Nestene plan takes shape, UNIT, the Doctor and his newly appointed scientific advisor, Liz Shaw, race against time to stop humanity being replaced by a terrifying plastic facsimile race. 4x 25 mins approx color episodes with mono audio. A Dandy and a Clown (dur. 42' 19") - this exclusive documentary looks at the life and career of Jon Pertwee. With contributions from actors Katy Manning, Judy Cornwell, David Jacobs, Geoffrey Bayldon and Kenneth Earle, Doctor Who writer and script editor Terrance Dicks and long-time friend Stuart Money. Carry On: The Life of Caroline John (dur. 29' 07") - a tribute to the actress who played the part of the Third Doctor's assistant in his first season. With husband Geoffrey Beevers, daughter Daisy Ashford, brother Seb John, sister Priscilla John and friends Jennie Heslewood and Patricia Merrick. Title Sequence Material (dur. 22' 38" ) - raw, mute test and build-up material produced during creation of the Jon Pertwee title sequence. Restoration Comparison (dur. 2' 13" ) - this release was mastered in 2K from the original 16mm camera negatives and interpos prints for the best possible quality. This short feature compares the results against previous versions and looks at some of the problems encountered during the remastering.